Glowing in the early evening, the Reunion Tower balls lights up over the downtown Dallas skyline on a cold December evening. Seen here from the nearby Trinity River, many famous high rises including the Renaissance Tower and the Bank of America Plaza shine brightly in this cityscape from one of Texas’ most vibrant cities. Glowing in the early evening, the Reunion Tower balls lights up over the downtown Dallas skyline on a cold December evening. 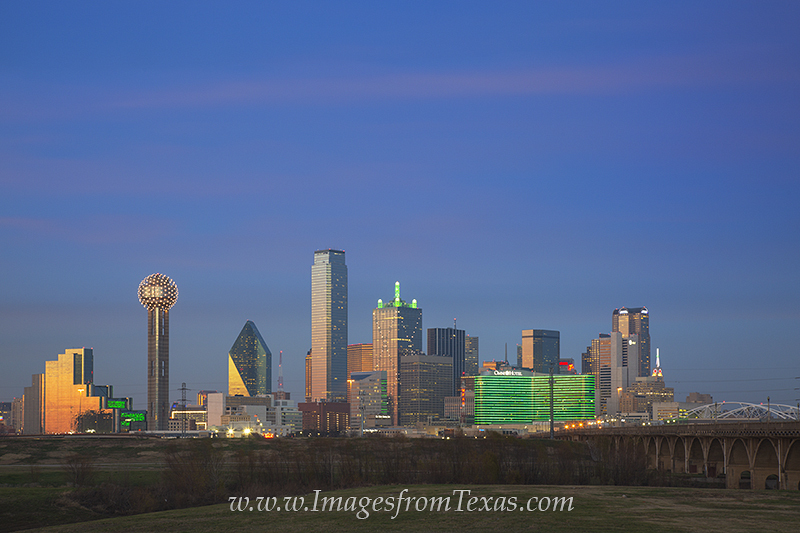 Seen here from the nearby Trinity River, many famous high rises including the Renaissance Tower and the Bank of America Plaza shine brightly in this cityscape from one of Texas’ most vibrant cities. Photo © copyright by Rob Greebon.